Although these plug-in soldering irons are considered to be good tools with much remaining useful life, they could be much better tools if a there was a reliable way to get consistent and precise temperature control from them. 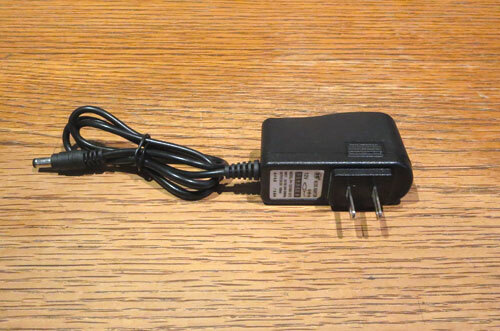 Shown below is a photo of the unit that started me thinking about how to find a way to control the temperature of a regular plug-in soldering iron. The unit got very hot the first time I used it. It has a built-in adjustment dial. Even after I turned the dial way down, the solder quickly boiled away and the tip started to oxidize. It seems to work pretty good, now with this new circuit. A high quality soldering station uses a built-in temperature sensor in combination with a controller to send power to the iron in pulses at full power. The frequency and duration of these pulses depends on the temperature of the sensor. 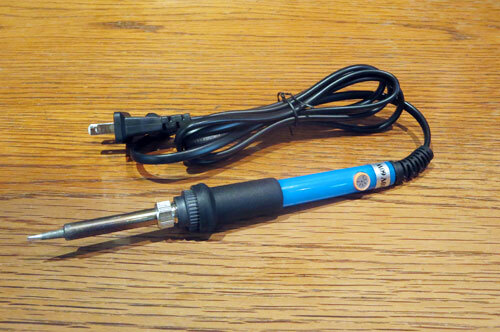 In this way the temperature of the soldering iron can be regulated in a very precise way. 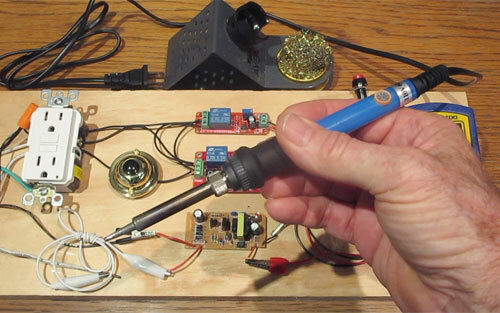 The usual way to regulate the temperature of most plug-in soldering irons is to use some kind of dimmer control because they don’t have a built in temperature sensor. They don’t send impulses on and off in different time intervals, rather they are controlled by a steady flow of power at a constant rate. It is not easy to achieve a constant temperature on a plug-in soldering iron with a dimmer or other constant flow of power. I got the idea that maybe sending power to the soldering iron in timed pulses might be the way to go. The only way to find out was to test it. WARNING!! – DO NOT ATTEMPT to construct this circuit unless you know what you are doing! There exists a possible danger of electric shock WHICH CAN BE FATAL. There are bare wires in this circuit and you must not touch any part that carries live AC current. 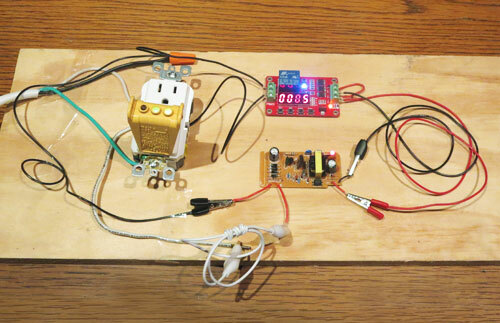 If you decide to construct this circuit or work with it, you do so at your own risk! 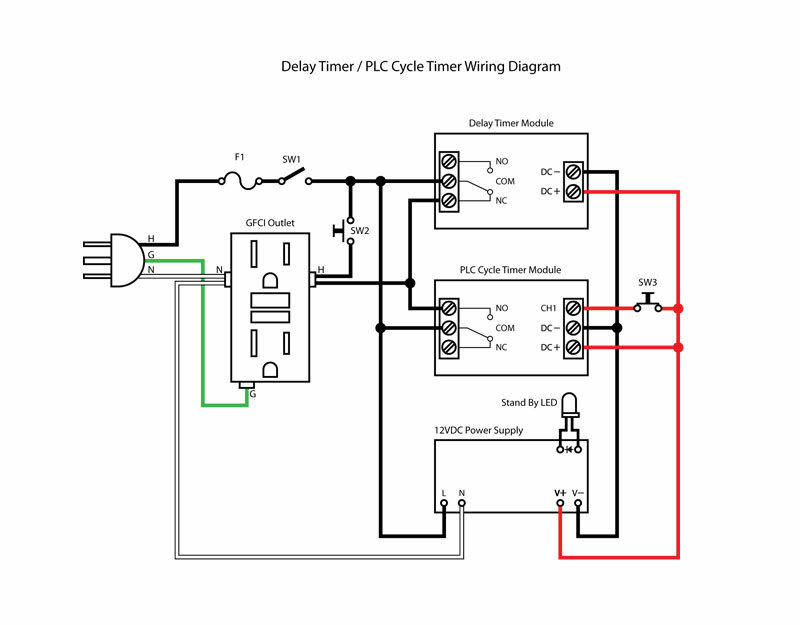 The circuit uses the cycle timer to send timed power pulses to the GFCI outlet. The soldering iron is plugged into this outlet. 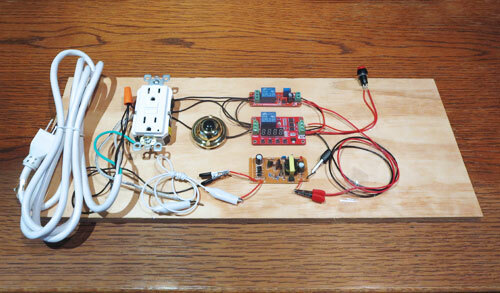 The circuit uses a delay timer for a cold start and a momentary switch for a warm start. It also has a 12v DC supply to power the two timer circuits. This wiring diagram also shows a fuse (F1) and a master switch (SW1) which would be mounted on the finished unit in an enclosure. The GFCI outlet is rated at 15 amps but a 60w soldering iron running 110v would only draw .55 amps. The fuse is to protect the relays on the two timer circuits which are rated at 10 amps for 110v. 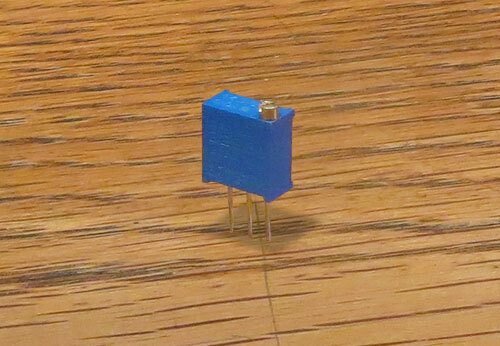 In practice, I would use a 5 or 8 amp fuse as long as switches SW1 and SW2 are rated at more than 8 amps. I found this PLC cycle timer relay module online for a very reasonable price. PLC stands for “programmable logic controller”. PLC is a system for automation and control of electromechanical processes like temperature control. The idea was to work out the time on and time off cycle (duty cycle) for a particular temperature for a particular soldering iron and see if that would regulate the temperature of the soldering iron in a way that was close to how it worked for a high quality soldering station. I put together an earlier version of the circuit but I wasn’t happy with it yet. It would pulse power on and off at precise intervals, but it would still take a long time to heat up the iron. Then I got the idea that I could use a delay timer circuit to send full power to the iron for the initial heat-up period only. The delay timer can be wired to either initiate a connection or terminate a connection after a certain time interval. This unit is wired up to terminate power to the GFCI outlet after the time needed for a cold start. In other words, when the circuit is first powered up, there is an AC line supplying power to the GFCI outlet for the time delay that the unit is set for. When it goes off, the relay switches to an open contact and cuts the AC supply to the outlet. The delay timer would need to be set somewhere in the range of 0 – 100 seconds. I just happened to have a delay timer circuit that I wasn’t using, but it was only good for 0 – 10 seconds. I knew that wasn’t enough, so I hacked the unit. To be honest, the hack was a bit sloppy because I was only using a soldering iron to heat the pads on the circuit board. The trimmer has 3 leads and moving the soldering iron around between the pads just doesn’t cut it. To be able to do the job right, you need a hot air rework station and I don’t have one (but now I plan to get one). You have to be able to heat up all the pads at the same time. But I was able to get the leads soldered half way and it was working so at least I could test the concept. I also had to use a stop watch every time I adjusted the trimmer pot. This was a big inconvenience. 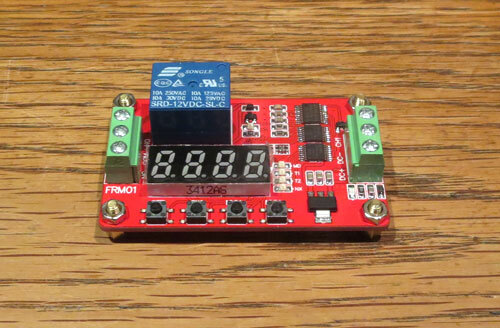 A more suitable delay timer module with a digital display would have to be found for this circuit to be put into daily use. I’ve got one on order and I’ll see if I can get it to work. The next hack was to cannibalize a 12v AC adapter for the power supply. The circuit boards run on 12v DC. I wanted the unit to be self-contained and I didn’t want it to have to be plugged into two AC outlets. The AC adapter was an easy tear down. The circuit board slid right out and I just cut the leads. 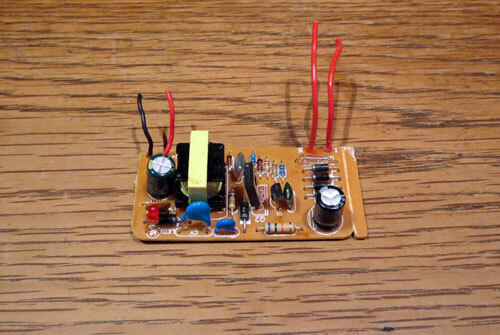 Shown below is a photo of the 12v DC power supply circuit board. The finished test board is shown below with a doorbell switch for the warm start and an on-off SPST switch to initiate the continuous cycle function on the PLC cycle timer. By default it will initiate the countdown for continuous operation when it is first powered up, but if the unit is paused while powered up, the continuous function has to be re-initiated with a 12v pulse. The only way to determine the on time and off time for the cycle timer and the cold start time for the delay timer is through trial and error. Keep the two settings separate at first. Don’t try to adjust them both at the same time or you will experience frustration. Just remember that the on and off times for the cycle timer is what will determine the constant temperature. Even if you have too much or too little time for the cold start it will only prolong the time it takes for the temperature to settle into a relatively constant state. Just make note of the on time and off time and duty cycle each time you make a change. You can set longer or shorter on and off times and still have the same duty cycle. For example, 2 seconds on and 6 seconds off is a 25% duty cycle. So is 1 second on and 3 seconds off. They are both 25% duty cycle but they may yield different results. The duty cycle is just a guide to help narrow down the on and off times. It is an indicator and it does help when trying various on and off time combinations. For example, in my case the target temperature I was aiming for was 343°C (650°F). 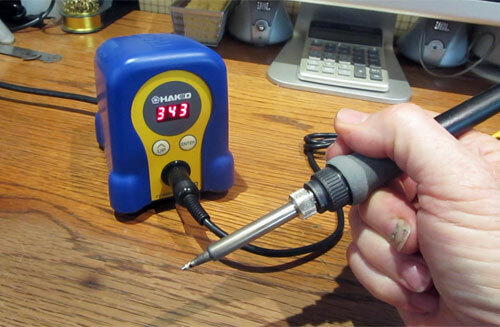 The reason I chose this temperature is because my Hakko FX-888D is set for that temperature and it works well for me so I wanted to set my plug-in soldering iron for the same temperature. I just took a shot and set the unit for 5 seconds on and 3 seconds off. That is a 62.5% duty cycle. The duty cycle will be the on time (5 seconds) divided by the sum of the on and off times (5 plus 3 = 8). That’s 5 / (5+3) or 5/ 8 = .625 or 62.5%. The soldering iron was way too hot (I shut it down when it climbed past 470°C), so I tried the reverse: 3 seconds on and 5 seconds off (37.5% duty cycle). The temperature settled at 399°C. I tried a few more combinations. When I tried 2 seconds on and 6 seconds off (25% duty cycle) the temperature was 350°C. I was getting close. I knew that the final on and off times would have a duty cycle that should be just under 25%. After a few more attempts with whole numbers I started using tenths of a second. After about three more attempts, I tried 1.6 seconds on and 5 seconds off. That was a 24.2% duty cycle. The temperature was pretty close to 343°C so I settled on that. For the cold start delay time I tried 43 seconds, then 42 seconds, then 40, then 38 and finally 36 seconds. That seemed to work well so I left it at that. In real world use, the circuit has to be used in conjunction with a soldering tip thermometer to know when the soldering iron reaches the target temperature and to be able to gauge how long to press the momentary switch when doing a warm start. 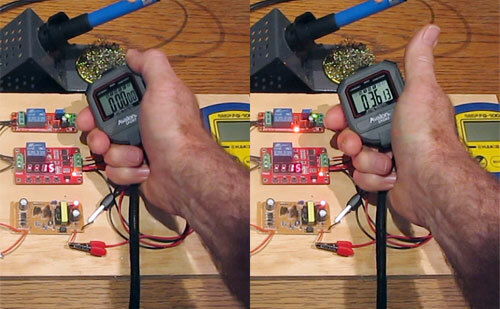 But once the soldering iron reaches the target temperature, there is no need to keep measuring the temperature. There was no practical way other than to use a momentary switch for the warm start. But it was a lot easier to figure it out just by making a video of the cold start and watching the tip thermometer and noticing when the red LED lit up on the delay timer. After sending full power to the soldering iron for a number of seconds, the temperature will keep rising after the power is cut. I noticed that when the delay timer fired, the temperature was approximately 280°C. The cycle timer was running and it kept rising at a fairly steady rate until it started slowing down around 330°C or so. It kept on rising until it hit the target temperature of 343°C. So when I did the warm start I just held the button down and watched the temperature. I wanted to release it around 280°C. I wasn’t right on but it was close. Without having used the unit in actual day to day operations, there is one other improvement I can think of. 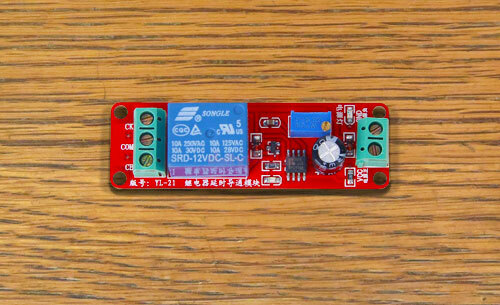 If the delay timer were to accidentally reset and start a fresh countdown when the soldering iron has already reached the target temperature, that could cause a problem. The soldering iron could overheat and damage the work piece or the soldering iron tip and make trouble for the operator. This can happen if there is a bad connection on either the positive or negative 12v supply lines going to the delay timer. If one of these wires were to make intermittent contact with the screw terminals on the module, then this is a possibility. There should be some kind of safety cutoff in the AC line going from the delay timer relay to the GFCI outlet. Once the delay timer has fired, the conductor going to the AC outlet should be cut. 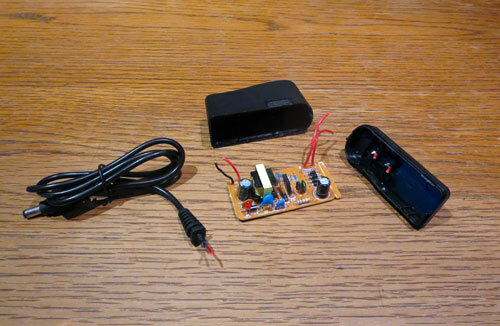 This can be done with a 110v relay wired to the normally open side of the delay timer relay. The 110v relay would have to be an SPDT switch with the normally closed contacts closing the circuit for the AC line that goes to the GFCI outlet. When the 110v relay is energized, it would switch to the normally open position and cut the line to the outlet.